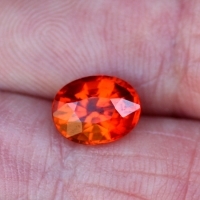 Spessartine previously named spessartite, is a nesosilicate, manganese aluminium garnet, Mn3Al2(SiO4)3. The names is a derivative of Spessart in Bavaria. It occurs most often in granite pegmatite and allied rock types and in certain low grade metamorphic phyllites. 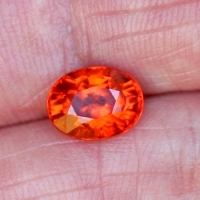 The major sources for gem quality spessartine are Sri Lanka and Brazil. Other sources include Australia, Burma, India, Israel, Madagascar, Tanzania (since late 2007) and the US. 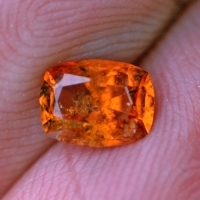 Spessartine of a orange-yellow is found in Madagascar (see Mandarin garnet). Violet-red spessartites are found in rhyolites in Colorado and Maine. 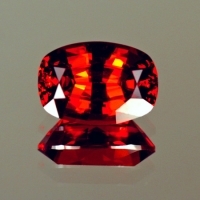 Spessartite garnet is a birthstone of January. Fine grade natural gemstone from Madagascar.